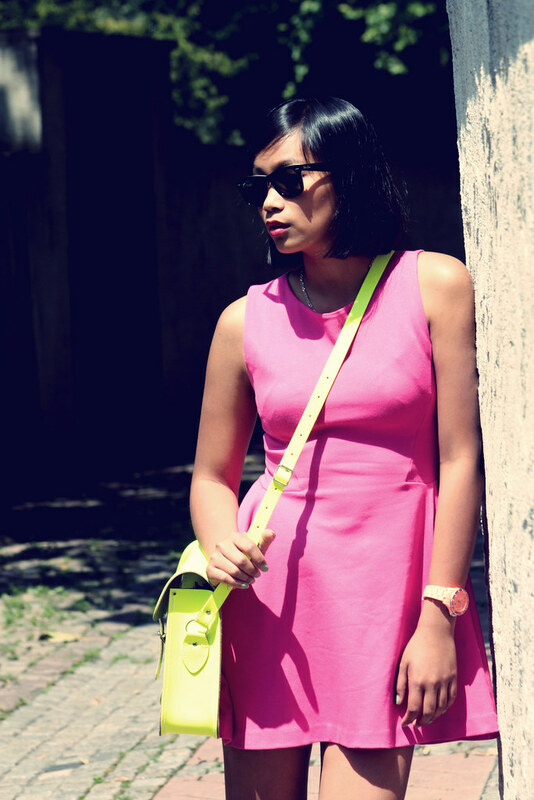 Mode Junkie: CRUISIN in my neon wheels with my candy shoes. I love how your bike matches your outfit!!! love your simple dress and adorable shoes! 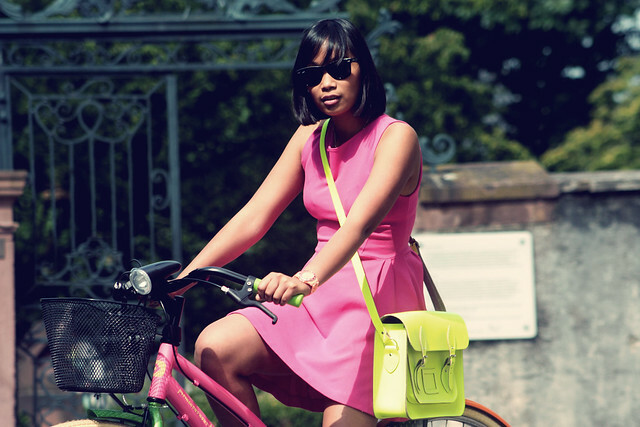 YAY, your bike is like an accessory to your outfit! Great colours!! Amazing you even found a cycle in the same colors haha ! Perfect outfit ! The satchel, the dress, and the SHOES ! I want everything !!! OMG OMG OMG I LOOOOOOOVE THE WEDGES !!!!!! That is some major colour blocking! Wow, fashion week. I am literally jelly. Sana ako din makalipat to Europe one day. North America doesn't cut it for me aha. The look is just perfect. Everything matches and you are beautiful! TGIF! perfection from head to toe, hun!!!! A, I want to eat your shoes up!!! And yay, we're bag twins. I have the neon green one. 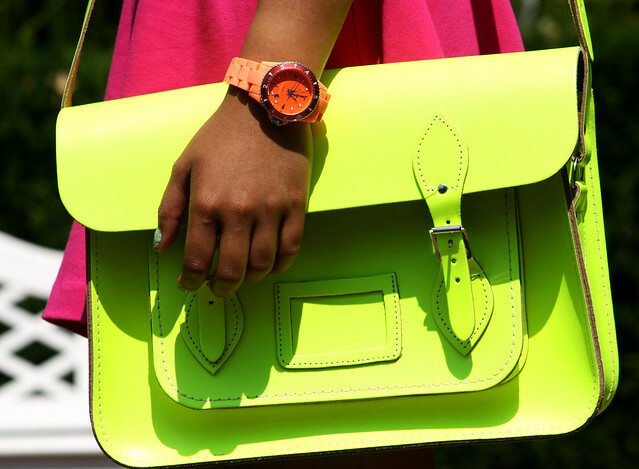 The nice people at Cambridge Satchel Co. were so nice to send one to me. I get tons of compliments everytime I wear it. Total eye candy! And I had an instant crush on your wedges. You look so cute! Have fun at Berlin fashion week! Super Outfit, ich liebe das Kleid und die Schuhe erst! Nice color, and amazing shoes. I love it! Die Farben sind ein Traum!!! Even your bike is cool, daaaaamn. Super cute! Love all the colors. Oh yes! I love this colours combination! Perfect look! Wow, you are working that satchel so well. I love your blog, btw. Totally love love it! everything's perfect. your dress,bag,watch,bike and those shoes *__* wow. WOW,babe!This is amazing!One of the best posts in a while!I love apsolutely everything,it's so charming that your bike matches your outfit! this is amaaazing! looove the colors! that bike goes so well with your outfit. beautiful photos.. what camera do you use? please answer me! I was also wondering if you could vote for me? Its for an elle magazine contest :D! Those boot/heels are quite possibly the most amazing shoes I've ever seen! you look so fabulous in these colours! the shoes are amazing! have fu on fashion week! Angelica! This is seriously amazing!! You loook soooo pretty dear. I may not comment often but if you only know, I'm really one of your fans! Love your style! There isn't an outfit post that I didn't like! THAT DRESS, THOSE SHOES, THAT BAG!!!! Oh God this outfit is so nice! I love the colors and your shoes rocks! im goin crazy for ur shoes!!! visit my blog login as areader and be a part of a giveaway! !